Stylish slimline chair with a modern feel. The stained framework has a beautiful marbled finish and is manufactured in a choice of different veneers. 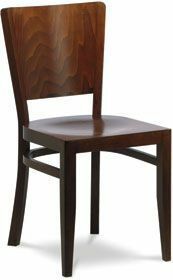 Popular all wood, stained veneer dining chair suitable for all modern cafes and restaurants. This chair is also available with an upholstered seat for comfort. Please contact our sales team if you require further information on this item.